The Jungle River, or the Mesozoic Jungle River, was a major South-to-North flowing river on Isla Nublar. It was used as the location for the Jungle River Ride attraction, which was later delayed due to the Dilophosaurus. The river, beginning from a lagoon in the Sauropod Paddock, twisted and snaked northwards through the Aviary, Dilophosaurus Paddock, and Ornithischian Paddock and to an area within half a mile of the Safari Lodge. The river itself nearly spanned the whole island, becoming narrower and narrower the further north it went, and some sections were only ten feet wide. Along these narrow sections, the current flowed faster. Various trees and foliage overhung the banks, blocking sunlight. In the Ornithischian Paddock, the river flowed over a man-made waterfall and down into a surging, bubbling pool. The waterfall itself could be manually switched on and off thanks to a pump machine system, which was activated by Dr. Alan Grant inside the Waterfall Recess. 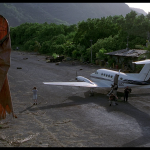 Unknown make and model vehicle present at Isla Sorna‘s airstrip compound in 2001. No further information available.